So you’ve decided to mess around with Elixir! Nice choice, let’s get started. Since you are coming from a Ruby background, you know how valuable using a version manager like rbenv or rvm can be. Since we are going to be installing two different programming language platforms, let’s find a solution that can handle all of our needs. Supported languages include Ruby, Node.js, Elixir and more. Supporting a new language is as simple as this plugin API. asdf allows us to use one tool to manage both Elixir and Erlang, and the next time I’m working on a Ruby project, I will probably switch over to using it as well. We can easily install asdf using Homebrew, so let’s run the command brew install asdf. The next important bit is at the bottom, you will need to initialize asdf whenever you start your shell session. I ran the following command to add that line to my .zshrc file, but you should add it to the approriate rc file for your shell. We’re almost there! Since asdf relies on language plugins, we have to add those now. Now we want to install the actual languages. The syntax for this is asdf install <language> <version>, so we can do the following. Let’s make sure that they were successfully installed, running the following commands should produce this output. asdf has the concepts of global versions and a local versions, but we are going to focus on the local version concept. Once we navigate into the directory of our project, we can set the version of Erlang and Elixir that we want it to use. This will add to (or create if there isn’t one already) the .tools-version file in the root of your project folder. It should now resemble this. Boom! You are now ready to get started with Elixir. 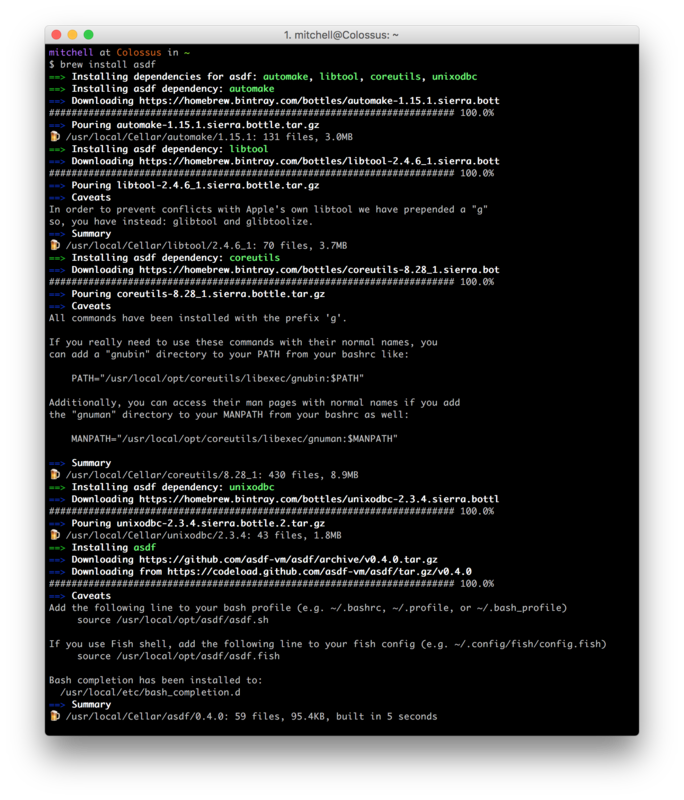 Checking the version of Elixir should now confirm that your project can find and use it.